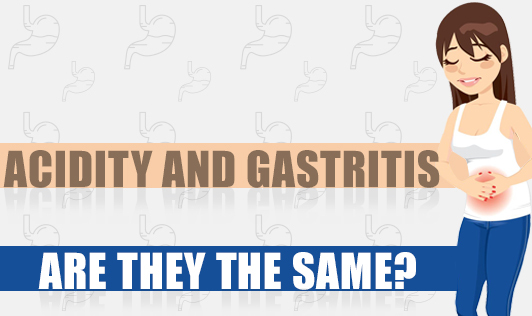 Acidity and Gastritis - Are They The Same? Acidity, also termed as Acid reflux and closely related to GERD (Gastro esophageal reflux disorder), causes the backward flow of stomach acid and bile juice into the esophagus - the tube that connects the throat and stomach. During an episode of acid reflux, you may taste regurgitated food or sour liquid at the back of your mouth or feel a burning sensation in your chest (heartburn). Gastritis is the inflammation, irritation and erosion of the stomach lining. It can occur suddenly (acute) or gradually (chronic). If left untreated, it may lead to severe blood loss formation of ulcers, and may increase the risk of developing stomach cancer. Gastritis can be caused by irritation due to excessive alcohol use, chronic vomiting, stress, excess bile reflux, infections and over use of certain medications such as aspirin or other anti-inflammatory drugs. Symptoms of acidity and gastritis can almost be the same. Certain lifestyle changes such as weight loss (if overweight or obese), eating smaller meals, and avoiding foods that seem to trigger heartburn such as fried or fatty foods, spicy foods, chocolates and peppermint, avoiding alcohol and smoking may help to improve the condition. Sometimes, over the counter medications helps treat the above depending upon the individual's condition. However, it is best to take a doctor's advice before you use any medications. If it turns out to be severe with vomiting, loss of appetite, indigestion, and difficulty in swallowing and pain in the upper abdomen, then the diagnostic tests may be required. To confirm the diagnosis, medications are prescribed, and if they are effective in treating heartburn/ acid reflux, a diagnosis of GERD is considered confirmed. Blood tests, endoscopy and biopsy are further required to confirm the condition. Check if your physician reviews your personal and family medical history. Make sure he performs a thorough physical evaluation, and then recommends you any of the above tests mentioned!